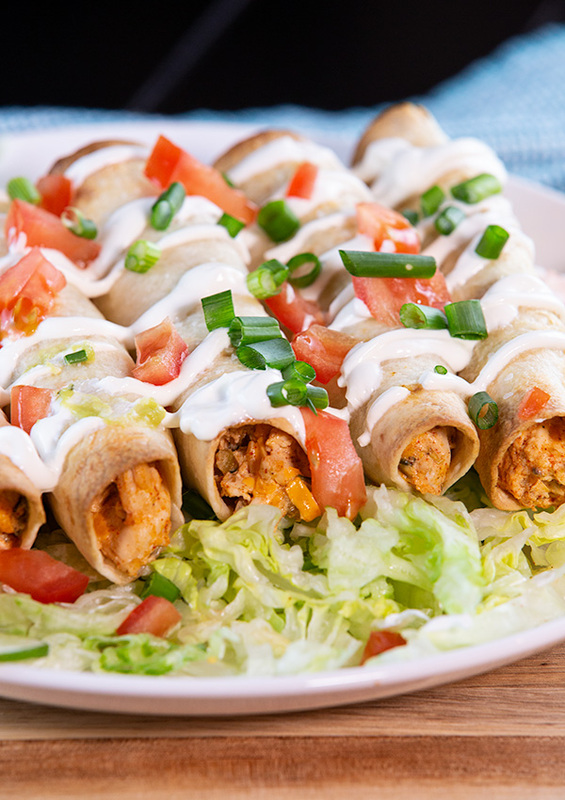 Oven Baked Creamy Skinny Chicken Taquitos are a healthier take on traditional fried taquitos. Stuffed with chicken, cheese, cilantro, and onion, and baked to crispy perfection, this is a recipe you will love! 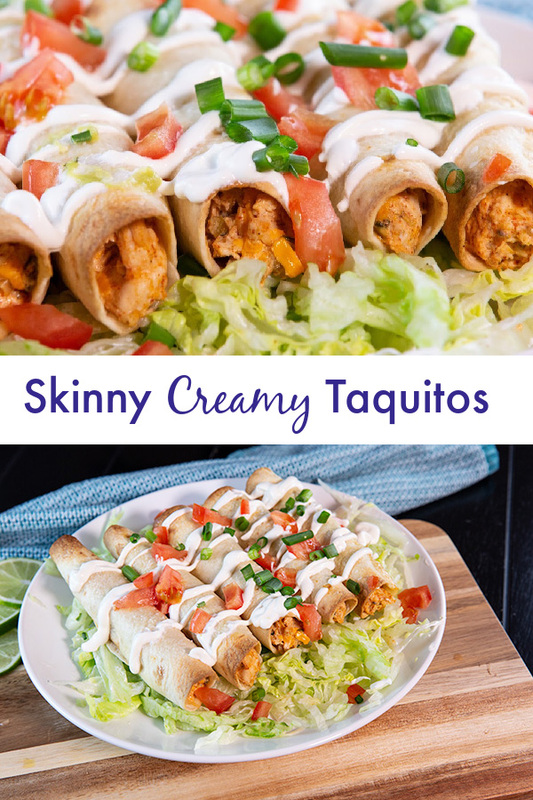 This may come across as an exaggeration, but trust me when I saw that these Baked Skinny Creamy Chicken Taquitos are currently on my list one must-make-again-and-again-and-again list. They are so good and so easy! 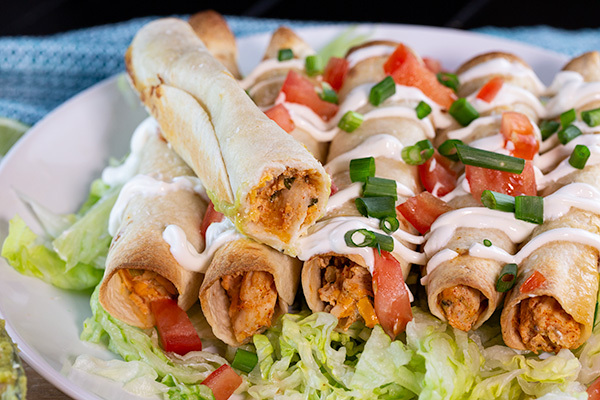 This recipe for Oven Baked Creamy Chicken Taquitos is an easy recipe made even easier with the help of a rotisserie chicken from the store. You’ll need about two cups of chicken. If you don’t buy a rotisserie chicken from the grocery store, another option is to make my slow cooker shredded chicken. One of my favorite kitchen hacks involves getting one of those big, juicy, rotisserie chickens from Costco any time a recipe calls for shredded chicken. Not only are those chickens delicious, they are so reasonably priced. A taquito is a traditional Mexican dish made with a small tortilla filled with a mixture like beef, cheese, or chicken. Often times a creamy taquito is made with cream cheese, and while it’s delicious, I wanted to try lightening up this recipe without the use of cream cheese which is where plain greek yogurt comes in. Greek yogurt works so perfectly in this recipe to give it the creamy filling that you crave. What do you fill a taquito with? 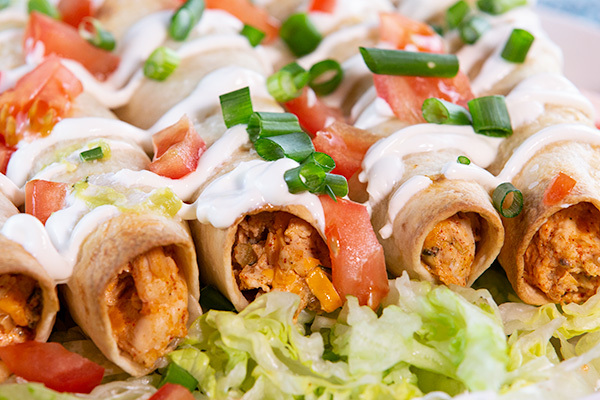 Taquitos are generally filled with beef, cheese, or chicken. My recipe includes shredded chicken, greek yogurt, fresh lime juice, taco seasoning, green onion, cilantro, salsa verde (green salsa), and shredded cheddar cheese. How do you roll a taquito? I like to place a small fajita sized tortilla on a flat surface. Then, scoop about 1/4 cup of the filling mixture onto the tortilla towards the bottom and roll it up tightly. Because these are baked taquitos instead of fried, you’ll prepare a large rimmed baking sheet with foil. First spray the foil with non-stick cooking spray, then place your taquitos on the pan. The key instruction that you need to follow if you want crispy baked taquitos is to spray them with baking spray before you bake them. This helps them crisp up and while they aren’t quite as crispy as if you fried them, they are still incredibly delicious. While I used chicken, if you had extra shredded beef on hand, this would be a great way to use it. 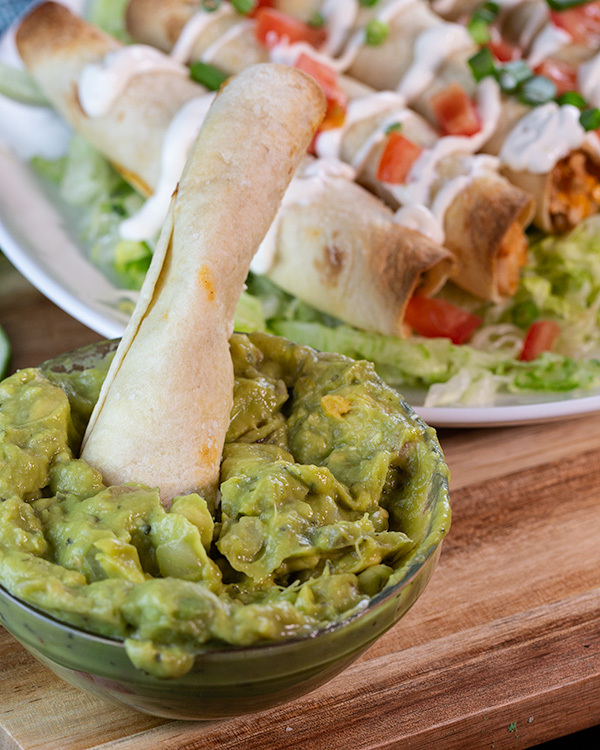 Are taquitos an appetizer or main dish? Basically the best part about these taquitos aside from the fact that they are so good and so easy to make is that they can double as a main entree or an appetizer. This is an easy recipe that can be made any time you have leftover chicken on hand. Be sure to sprinkle the taquitos with sea salt or kosher salt before baking because that adds a little something special that makes them SO good. 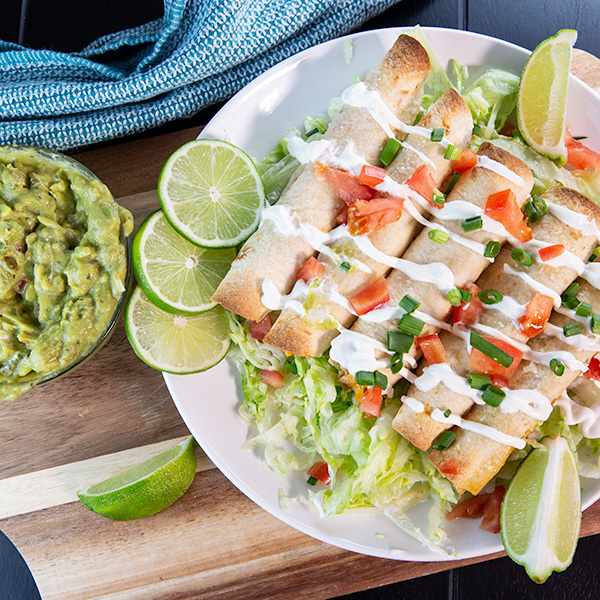 To serve, I like to place the taquitos on a bed of shredded lettuce and drizzle with sour cream or greek yogurt, and top with extra green onion, chopped tomatoes, and I love serving them with my homemade guacamole! It is really the best guacamole ever! If you’re looking for another Mexican inspired recipe, we also love this Taco Dip or these Baked Flautas. Pro tips: I’m a big fan of shredding your own cheese. You can use a reduced-fat cheese if you’d like but it’s not necessary. I personally prefer regular cheese over the reduced-fat variety. Taco seasoning: You can buy some from the grocery store or use my homemade taco seasoning. Greek yogurt: Even if you don’t like greek yogurt, I promise you don’t taste it in this recipe. It just adds the delicious creaminess that make these taquitos perfect. They are best eaten fresh as they’ll lose their crispiness should you store leftovers in the fridge. Line a rimmed baking sheet with foil, and spray with non-stick cooking spray. In a large bowl combine greek yogurt, salsa, lime juice, and taco seasoning. Whisk to combine. Stir in cilantro, green onions, chicken and cheese. Begin making the taquitos by scooping 1/4 cup mixture on each tortilla. Place the mixture towards the bottom of the tortilla, then roll it up tightly. Place each taquito seam side down on the prepared baking sheet. Spray the tops of each taquito with cooking spray, then sprinkle each with a bit of sea salt or kosher salt. Bake for 15-20 minutes. To garnish: I like to place them on a bed of shredded lettuce then drizzle with sour cream and top with chopped green onion and tomato.